It’s great to see local companies get involved in the motocross scene. The Earle Company is a New Jersey-based road construction company that is helping out local expert rider Jesse Pierce this season. Pierce’s bright yellow and green gear, bike and pit set-up match the appearance of the Earle Company’s fleet of construction equipment that can be found across New Jersey doing various projects. If you are interested in getting to know Jesse or more about the Earle Company and their capabilities, come down to Raceway Park on Sunday. WALL, N.J. (June 14, 2018) – Earlier this year, after a three-year hiatus, motocross racer Jesse Pierce (Clarksburg, New Jersey) returned to Old Bridge Raceway Park and took home the first place overall title in the “Open Expert A” class in the raceway’s final race. Now, Sunday, June 24, Pierce will once again compete for the second time this year. Pierce, 22, who won his first national title in 2009, is currently being sponsored by The Earle Companies (Earle) – New Jersey’s leading road construction company specializing in private and municipal road construction and paving, heavy and highway construction, as well as the manufacturing, recycling, and transportation of construction-related materials. Pierce took a break from racing due to financial reasons, but now, thanks to the support and help of his sponsor, Earle, Pierce is back on track. Pierce will once again be racing aboard his Husqvarna 350, which is now decorated with the iconic Earle owl. 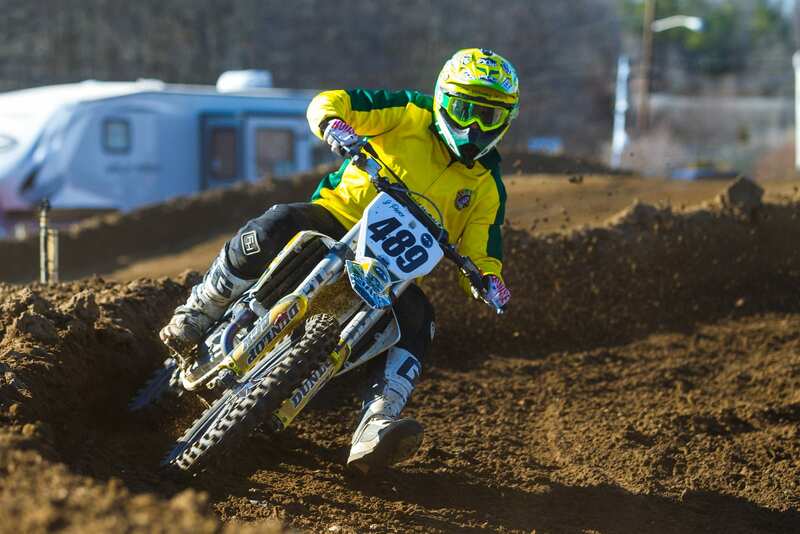 Motocross racer, Jesse Pierce, to race at the Old Bridge Township Raceway’s new motocross tracks. Pierce, sponsored by The Earle Companies, will be available for a personal appearance and interviews. In addition, The Earle Companies will be on site supporting Jesse and recruiting for various job opportunities. Potential employees will have the opportunity to talk with company representatives and fill out an application. Company representatives from Earle will be on-site from 10 a.m. – 4 p.m.
Old Bridge Township Raceway Park. Under The Earle Companies tent. Motocross racer Jesse Pierce and sponsor The Earle Companies. The worth of the bike is $12,000. What’s more, Earle has also helped to construct a motocross practice track in Freehold, which was made in conjunction with Delb, a lifestyle-clothing brand that started in Point Pleasant. For more information on The Earle Companies, visit earleco.com.